You can transfer money to overseas bank account through DBS iBanking. 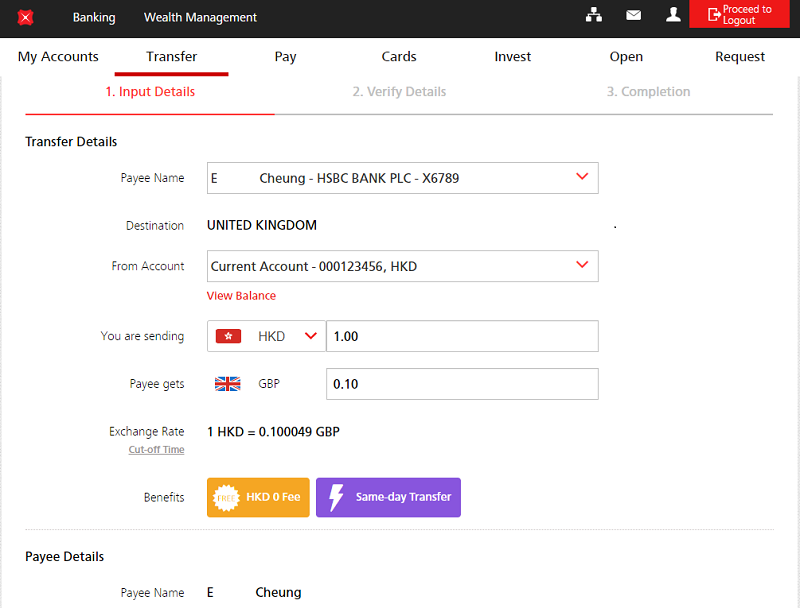 Your daily limit for overseas funds transfer is HKD1,000,000 (combined limit of all overseas funds transfer, including DBS Remit). 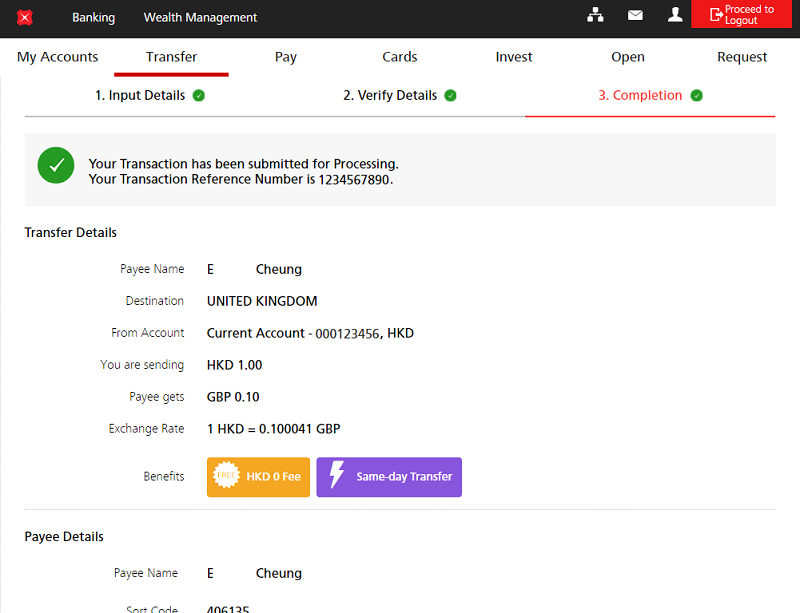 DBS Remit same-day transfers are only applicable on Monday to Friday within the respective cut off times, except on public holidays in Hong Kong. Applications can be submitted 24/7 but those outside the cut-off times, non-clearing day (clearing day means Mondays to Fridays, except public holidays in Hong Kong) or on Public Holidays or on the day Typhoon signal No.8 or above or black rainstorm warning signal is hoisted will be sent on the next clearing day. For instructions placed before the cutoff time, the transfer will be performed on the same day. However, this may vary depending on the local public holiday and the processing time of the agent/recipient bank. Any Overseas Transfer instruction placed after 5:00 pm (Monday to Friday, except public holidays in Hong Kong) or on a non-clearing day will be processed on the next clearing day. Any remittance instruction involving currency conversion placed after the cut off time or on a non-clearing day will be effected according to the prevailing exchange rate when the instruction is executed. In general, the recipient of overseas transfer will be able to receive the funds within two to four working days of the recipient bank from the transfer date. However, this may vary depending on the destination or bank to which the payment is made. When you submit your remittance instruction to a new payee via DBS iBanking successfully, the corresponding payee will be added to the registered payee list automatically. Please ensure you have provided correct information and have sufficient funds for the processing of the remittance instruction. In the event of missing information and/or insufficient funds in your debit account, the Bank reserves the right to reject the instruction. You may amend or cancel any remittance instruction submitted if it has not been executed. If the instruction has been executed, no amendment or cancellation can be made unless agreed by the recipient or the recipient bank. Please visit any of our branches to amend or cancel any instruction submitted. An amendment or cancellation fee will be charged. All remittance instructions are subject to verification by the Bank and may be rejected at the Bank’s sole discretion. The daily limit for Overseas Funds Transfer will be reset to HK$0 if no such transaction is conducted for 12 months. DBS Remit (Transfer to China) is only applicable to customers with Single name account with HKID. This service is not applicable to customer holding passports or customers with Joint account. The daily limit of RMB remittance to Mainland China is RMB80,000 per person for Hong Kong residents. RMB remittance to Mainland China requests made by non-Hong Kong residents are not accepted. The name of the beneficiary account in Mainland China must be identical with the name of remitter’s account. If we are unable to confirm or verify that you are the holder of both accounts, we reserve the right to reject the RMB telegraphic transfer and remove the related payee from the registered payee list. If the name of beneficiary account in Mainland China is registered in Chinese, please specify the account name in Chinese under “Your Name in Recipient Bank’s Record”. # Applicable for transferring USD to United States, CAD to Canada, GBP to United Kingdom, AUD to Australia, SGD to Singapore, RMB to China, EUR to designated Eurozone countries, INR to India, IDR to Indonesia and PHP to Philippines. ^ If charge at cost is higher than the respective charge, at the Bank’s discretion, the Bank may adopt a higher charge.